The frenzied activity of major developers such as Nakheel, Dubai Properties Group, Emaar, Damac, Binghatti and Azizi across Dubai in preparation for 2020 has positively influenced the supply of good-quality villas and town houses at affordable prices and in good locations, leaving investors, buyers and renters spoilt for choice. In the matter of villa vs town house, a town house emphasises the terraced portion found within compact affordable complexes with shared amenities. A villa is more focused on compounds, which are less crowded and possibly of better design, and a more luxurious interior constructed upon a larger plot with landscaped gardens, communal amenities and a better view. Choosing between a town house and a villa depends on a number of personal considerations, including but not limited to budget, lifestyle, the occupant’s objective, family size, and an investor’s expected return on investment (ROI). Town houses are usually identified as more affordable than villas. Depending on one’s preferences, choices could range from a prime location such as the Lakes, a developing area supporting affordable homes such as Al Furjan, the outer ring of Dubai offering communities such as Mira and Mudon on Al Qudra Road, or in more desirable precincts such as Arabian Ranches. As per research by ValuStrat, we find that the range for a three-bedroom villa within The Lakes is from Dh3.3 million-Dh3.7 million, as opposed to a three-bedroom town house in The Lakes at Dh2.2 million-Dh2.7 million. A three-bedroom villa in Al Furjan will be in the range of Dh3.2 million-Dh3.5 million, while a three-bedroom town house in Al Furjan will achieve Dh1.9 million-Dh2.4 million. A three-bedroom villa in Mudon is capable of selling in the range of Dh3.4 million-Dh3.9 million, while a three-bedroom town house in nearby Mira sells at around Dh1.9 million-Dh2.4 million. 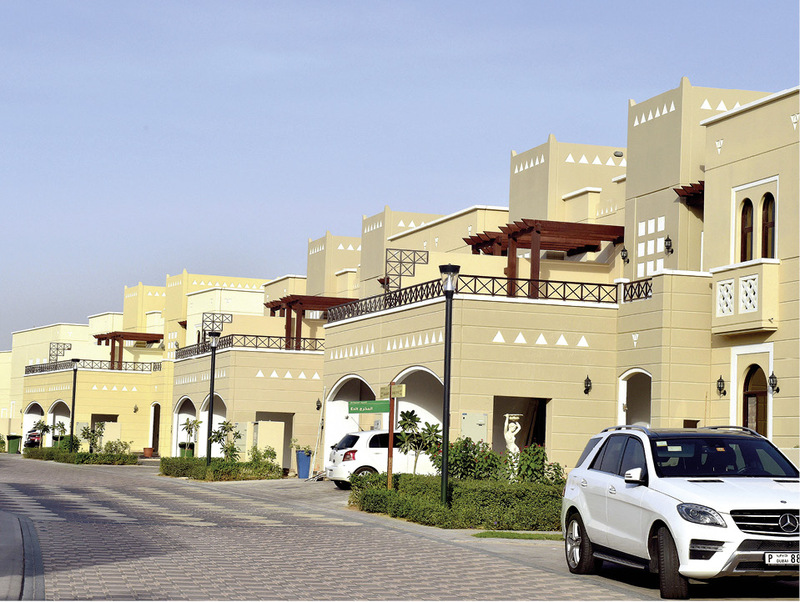 A three-bedroom villa in Saheel in Arabian Ranches is currently achieving Dh2.9 million-Dh3.3 million, while a three-bedroom town house in the Al Reem community of Arabian Ranches realises Dh1.8 million-Dh2.4 million. To meet the growing needs of a family with children or those living with extended family and pets, the requirement is usually for a larger plot — preferably a villa close to parks, pools, schools, medical facilities and with the added possibility of social connection with similar family units. In this regard living in a villa community may be preferred. A young professional couple may want to be close to a health, spa and fitness centre, gyms, restaurants and coffee shops. They may also want themed lifestyle developments offering leisure facilities such as golf courses and club houses for social interaction, and may also enjoy travelling for leisure or alternatively for work. They may also prefer a “lock up and go” lifestyle and elect the town house option. Bachelors and single women professionals often opt for prestigious and strategically located apartments on locations such as the Dubai Marina, which offers beach and marina access and activities such as cycling, volley ball, kayaking, or Downtown Dubai, which features international retail offering, malls, restaurants and the convenience of easy access to public transport. For most villa and town house occupants a view is one of the selected criteria, albeit over water, canal, swimming pool, park or landscaped gardens, as opposed to construction in progress on a neighbouring site, a blocked view or looking directly onto the neighbour’s property. It is found that in most affordable compact town houses the view is generally that of the community. An attached or terraced town house offers very little insulation when it comes to rowdy neighbours, while a villa offers a lot more distance and privacy especially for outdoor living. Parking in town houses is usually very limited within a confined space with not much provision for additional parking for visitors, while villas may provide additional on-street parking. The maintenance cost of a town house is usually less than a larger villa in that the built-up area is smaller, with insurance premiums, service charges and garden maintenance being more affordable. The cost to refurbish, fit-out, decorate or furnish a smaller town house is also more manageable than a larger villa. Finding the perfect residential community that combines work, home, leisure and play is inextricably linked to transport and ease of access to schools, work, home and leisure facilities. Travelling time, traffic congestion, access to public transportation are all part of the decision-making process and will be one of the deciding factors in the selection of a villa or a town house. Cheryl McAdam is director of residential real estate at ValuStrat. The views expressed here are her own.